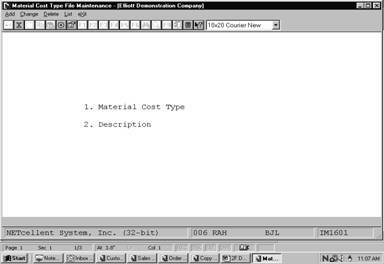 The Material Cost Type File Maintenance application maintains a convenient table of inventory item material cost classifications, i.e. raw materials or finished goods. The material cost type is used on reports, or on entry screens, where verification of a material cost type is required. All inventory item material cost types used by your company may be entered into this file. Enter the one‑character number or code, which will be used to identify the material cost type. 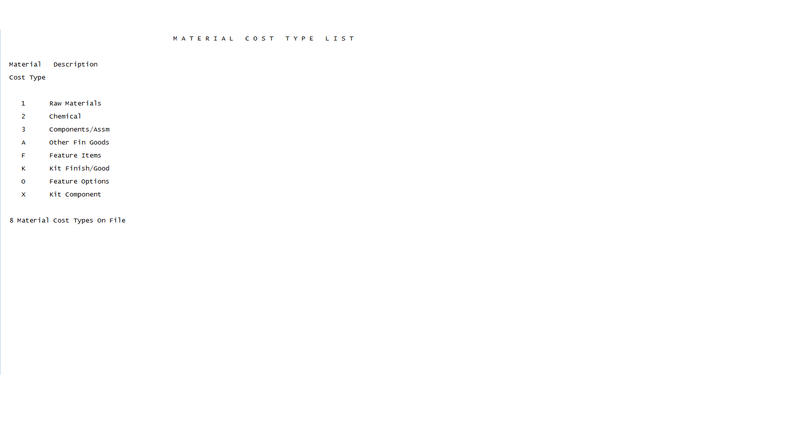 In the change or delete mode, press the F7 key to search for material cost type. Enter a meaningful description of the material cost type. Lower case characters are permitted. This description will appear on various reports and screens in the package.